As mentioned yesterday, it was not until 1974 that I got the real-deal, and a double-whammy at that. It was February 12th, 1974 that I first met the great Tibetan siddha Chögyam Trungpa Rinpoche. I had read his books, particularly "Cutting through Spiritual Materialism" and heard he was coming to the U-M Campus to speak. I called the number that was listed for more information and ended up designing the poster for the event and being Trungpa's chauffer for the weekend. What a life-changing event that was! By that time I knew some of the lingo of Buddhism and had been trying to meditate for years, but I really didn't know how to meditate or if what I was doing was correct or not. Back then we never shared what our meditation was like. It was considered too private. What a mistake that was! Then here comes Chögyam Trungpa Rinpoche to provide for me a deciding moment. I have told this story many times, but if you don't mind, I will tell it briefly once again. I had to pick up Trungpa Rinpoche at the airport, and all I had was a beat-up old Ford station-wagon, one that when you turned to key off and removed it, continued to sputter and belch smoke of another ten seconds or so. Some of you must know what I am talking about here. It was what we call a beater. But there I was at the airport (and early) in my Sunday best (which since I never went to church Sundays was not much), but as enthusiastic as all get out. Let me tell you, I was pumped. And the plane was a little late and the passengers filed out, but no Rinpoche. Then way at the back I saw this short Tibetan man in a suit and he was smiling and at me! And suddenly there we stood, eyeball-to-eyeball, even a little too close for my comfort. I am sure I mumbled something but what I saw was this very tired pair of eyes staring into mine, and with a yellow tinge to them at that. Then Trunpa, still looking right at me, rolled his eyes up into his head until all I could see were the whites, and they stayed there for an uncomfortable amount of time. When at last they rolled back down, I found myself looking into perfectly clear eyes with no tiredness or yellow. Suddenly here was this incredible being staring right into me, and friendly too! Traveling with Trungpa was Larry Mermelstein, who was later to become the head of the Nalanda Translation Committee, in charge of translating so many valuable texts from Tibetan into English. I was already in some kind of contact high as we made our way out of the terminal, into my station wagon, and headed back to Ann Arbor where Trungpa would stay at the house Donald S. Lopez, Jr., professor of Buddhist and Tibetan Studies at the University of Michigan. I carried Trungpa's bags into the professor's house, where a small welcoming committee was doing just that. My job as chauffeur was done for the moment, but I hated to leave, so I kind of hung around at the back of the room taking this in. I was very intrigued by Trungpa Rinpoche. Before I knew it everyone there had decided to go for a tour of the U-M campus and they were heading for the door, while I scrambled to get out of the way, hoping I would not be noticed. Suddenly Trungpa Rinpoche said he was tired and that they should go ahead while he took a nap. I waited until the rest filed out and began to follow suit, when Trungpa motioned to me. "Michael, you stay here with me." This was like too good to be true, and he motioned me into a small room that turned out to be the professor's office and had me sit in a straight-backed chair that was there. Meanwhile, Trungpa Rinpoche proceeded to completely ignore me while he went over every inch of that office, picking up and examining all of the various statues and knickknacks that were there and, at the same time drinking a bottle of saké. I sat there like a bump on a log and hoped I was not disturbing him. Like a turtle coming out of his shell, I gradually relaxed and realized that Trungpa was totally occupied in every moment, delighting in everything that was there. I had never seen this kind of focus being exercised in my life, and that was my first lesson right there. My natural inclination in that kind of spot would be to do nothing but fidget, which is exactly what I was doing. After a while, Trunga finally got around to examining me and he proceeded to give me a series of instructions, never telling me what it was he was doing. But it had to do with watching my breath and breathing in and out, deeply, like we do when a doctor uses a stethoscope. And this next part is hard to describe, so you will just have to take my word for it. I was breathing in and out, as directed, but Rinpoche was concerned with my out breath, the way I was breathing out. He told me I was not letting the breath go out far enough, but somehow holding back. By now I was nervous for sure, and I sat there trying to exhale as hard as I could without actually fully exhaling. I was just too nervous and simply going through the motions. Then he said to me, "Michael, let it go all the way out. Don't worry, it will come back!" And with that I exhaled, and all of the way out too. And here is the unusual thing: at the same moment I let my breath go, in the back of my mind and at some higher level, all of my fears of death and dying that had haunted me arose like a swarm of darkness and just evaporated. Gone. I am still not anxious to die, but I no longer have the kind of dread and fear that I had before those instructions. 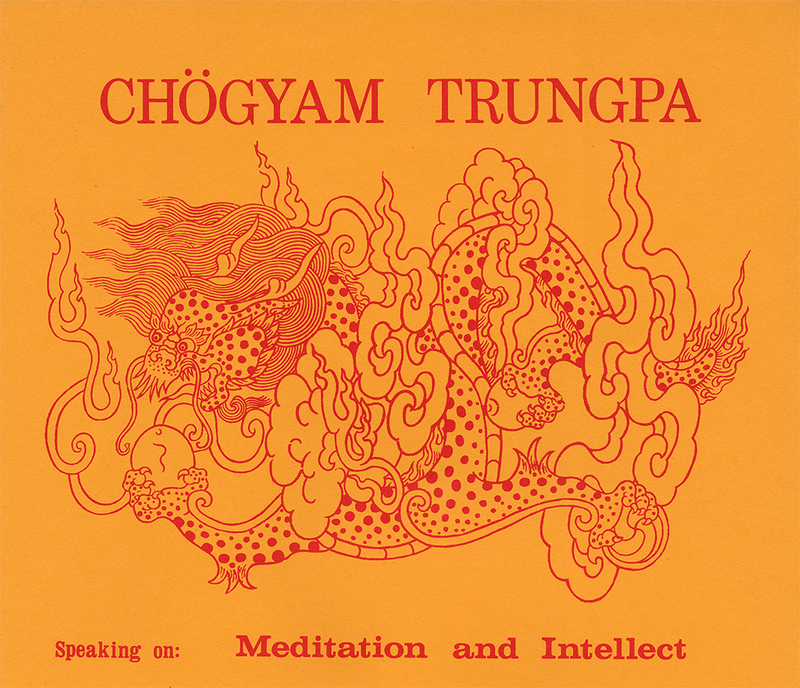 Of course, later I was to find that Trungpa Rinpoche was teaching me basic Shamata Meditation, the cornerstone of all basic meditation practice. I must have spent an hour and a half with Trungpa Rinpoche, after which he did go to take a nap, and I hit the road. We had one more significant exchange on the way out of the professor's house. Trungpa pointed to a copy of the poster I had made for his talk that was on the wall. It was a woodblock print of a Tibetan dragon flying in the clouds, while each of its four feet clutched a pearl. I include part of the poster here. "Do you know what this represents?" he asked? I told him I did not, but that I just loved the image and thought it might be appropriate for his talk. He went on to explain that the dragon, which in the Tibetan and Chinese cultures is perhaps the most important and positive of creatures, could fly, but only as long as he held those four pearls, one in each hand. If he dropped even one, he would fall from the sky. Of course, I took this in. Later I understood that the four pearls that the dragon held were what are called the "Four Thoughts That Turn the Mind to the Dharma," sometimes called the "Four Reminders." And those four thoughts have always been key in my understanding of the dharma. Here Trungpa was pointing them out to me and making it clear that we must hold all three thoughts in mind at once to maintain our awareness. The Four Thoughts are something one encounters at the beginning of Buddhist study, but also just before learning the highest form of meditation, called Mahamudra. They are profound and so much already a part of each of us. Trungpa was pointing something out to me. There are other stories of Trungpa's visit, perhaps for another time. I will never forget the last thing that Trungpa said to me. I was trying to tell him that he was the first person I ever met for whom I had no personal resistance or criticism. He turned to me, took my hand, and said: "Well, Michael, we are both married men and we are about the same age." And then he was gone. The second part of the double-whammy I referred to earlier is meeting His Holiness the 16th Gyalwa Karmapa, Ranjung Rigpe Dorje, the head of the Karma Kagyu Lineage, later that same year. This is the lineage I have belonged to since that time. That could be another story sometime.